Welcome to Way to the Well! I've been sending really great resources to my online tribe this past month, and I'd love for you to get in on all that goodness, too! Simply fill in the form to the right of the screen, or click here, and you'll receive your First Key to unlocking your soul's potential! ...but what is it all about? You know that repetitive thought that keeps nagging at you night and day? That negative emotion that eats away at your sanity? Others might be chasing their dreams, but it’s not for me. I’m just not (___fill in the blank ____) enough to reach my goals. I made my bed, now I must sleep in it.I just have to keep my head down, and wait until retirement before I live my real life. I feel like a robot.I don’t have enough discipline to develop my intuition. Do any of these statements feel familiar to you? I hear them all too often in my practice. Women come to me, often in tears, because they feel stuck. They feel they don’t have the courage, or the power, or the discipline, or the knowledge to be who they know they truly are deep down inside. There was a time in their childhood or early teenage years when they felt the freedom and the power of their intuition and creativity – but adulthood and its various responsibilities and negative experiences shut it all down. These women have forgotten how to truly shine. They forgot their joy. They set aside their magic. But THEY’RE READY TO CLAIM IT ALL BACK! What breaks my heart is that too often they have sacrificed their freedom and joy with the intention of “being there” for their children, or their spouse, or their job, or their ailing parents. If this sounds like you, please remember that when you don’t shine, when you don’t feel joyful and free… you’re not truly there for anyone, not even yourself! You might be there in person, doing the tasks that need to be done… but your soul is missing, and that leads to chronic sadness and anxiety. I love seeing the transformation that happens when I work with these women. In working with me, you will be able to see these transformations in you, too! Your eyes become brighter. You will smile more often. Your relationships flow with more ease. You will be more open to abundance. Your stress level will decrease. Even your children’s behaviour will improve! Connecting with your Soul is the fastest, easiest ‘get-the-answers-you-need’ way to move from a place of stress, confusion and fear, to a place of joy, creativity and inner peace! Your Soul is the key to profound shifts in your energy and your ability to love life. To unleash your magic, you need to journey to know YOU – all of you, your beauty, your wisdom AND your pitfalls and darkness. It’s not an either/or situation: in this world of contrasts, you are BOTH light and darkness, and you can’t ignore either of them if you wish to feel complete, fulfilled, and alive! When you step into that high vibe space and unlock that magic… well, miracles happen. My magic? I can get you re-connected with your Soul. Your Joy. Your true desires. Your gifts. I can see past your pain, past your ego resistance, past your blocks. I know when you’re out of alignment, and how to get YOU back in your life. Are you ready to give those nagging thoughts and emotions a kick in the behind? Are you ready to reclaim your freedom and your magic? Start with the first step to unlocking your soul’s wisdom! Sign up to my email list, and start receiving your Keys to Unlock Your Soul's Potential! 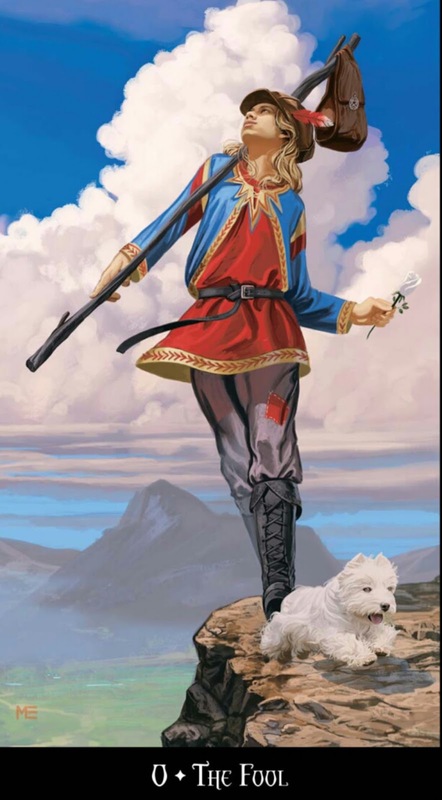 I’ve been meditating this week with the imagery of the Fool’s Card - the very first card of the Major Arcana in the Tarot. I’ve been gathering my thoughts and feelings about the entrepreneurial journey and how it starts with the Fool’s proverbial leap of faith - and when I realized this morning that we’re April Fool’s Day… well I just had to share my musings with you, because I think Universe has a special message not just for me, but for you, too! You see, there’s a lot of newness in my life lately: wonderful new clients have started a 6-month Soul Journey with me; new bright-eyed students are embarking on the Intuition Development journey; I have a new contract teaching meditation at a middle school; and I’m supporting a few of my graduates who are starting their own spiritual businesses. As I guide them on their journey, I am taking stock of my own: where I started coming out of the spiritual closet, the leap of faith I did leaving the security of the government job to start my business, the periods of growth that involved both deep bliss and many painful moments — all leading to greater wisdom and self-realization. When I look at all this newness with the free-spirited compassion and faith of the Fool, I am swept away with joy! I am feeling a lot of Love and a new appreciation for the Fool’s wisdom! Why? Because nothing new would ever happen without some of the Fool’s energy. Take a look at a Fool’s imagery (this one from one of my favourite decks, The Witch’s Tarot by Ellen Dugan), and the card’s description. Do you remember when you first graduated from University or College, and you felt ready to take on the world? Do you remember when you started that BIG project and you felt its successful completion down to your bones? Or maybe you moved to a new town and you just knew that life was presenting you with a fresh start that you were eager to experience? That is the energy of the Fool. The Fool reminds you that it’s OK at times to take on new projects or opportunities even if you don’t know where it will lead you. He reminds you to follow your heart, to follow your Bliss. He asks you to have faith that all will work out for the best. He also reminds you to not travel alone but to keep a cheerful and loyal companion with you on your journey. So on this April Fool’s Day, take a look at that big dream you have nestled in your heart. What if you could trust yourself that you have all the wisdom within to make it happen? What if you trusted yourself more? What if you gave it a go? What if you started something new and stepped out of your routine for a short while? What fresh possibilities could open for you then? Sure, the Fool seems oblivious to the risks of the Journey. But perhaps the risks of staying stuck, of keeping the status quo, of staying in the same boring routine are paling in comparison to the risks of forging ahead to a newer, wiser, version of yourself. If you set aside your fears, including fears of lack - what would be possible for you then? You are good enough, smart enough, ready enough for your life’s journey. Set aside your heartaches and mental chatter for a while, and just breathe into the freshness of April. Dream a little - and take a step forward. I am available to dream with you and journey with you. I can help you step out of a pattern of worries and anxious fears and into your more spirited self. Let’s explore how we can journey together: let’s chat. In my previous article, I wrote about my surgery and the healing of my Sacral Chakra. My Reiki and spiritual journey have helped me uncover emotional issues and mental & behavioural patterns that have contributed to my state of dis-ease. Energy work helped me gather life-force energy in my system so I wouldn't feel depleted after surgery. I used distance Reiki to send energy to the operating room and to all medical staff and hospital volunteers, so that I (and all other patients) would receive optimal care and nurturing. I the hour prior to surgery, I self-treated to prepare my body and my aura for the process. It also helped me stay calm and focused, keeping the pre-surgery jitters at bay! Friends, clients and students sent Reiki to myself and the medical staff so that everything goes well and according to plan. Just before anaesthetics, I felt very well surrounded and comforted. Reiki helps detoxify the body from the chemicals used. Healing on all levels is quicker. I recuperated my healthy energy levels very quickly - I was even able to exercise lightly the day after surgery! Will you or a loved one be undergoing surgery in the near future? Ask me how we could put together a plan to nurture and support vital life force energy! Of course -- this does not replace proper medical care! 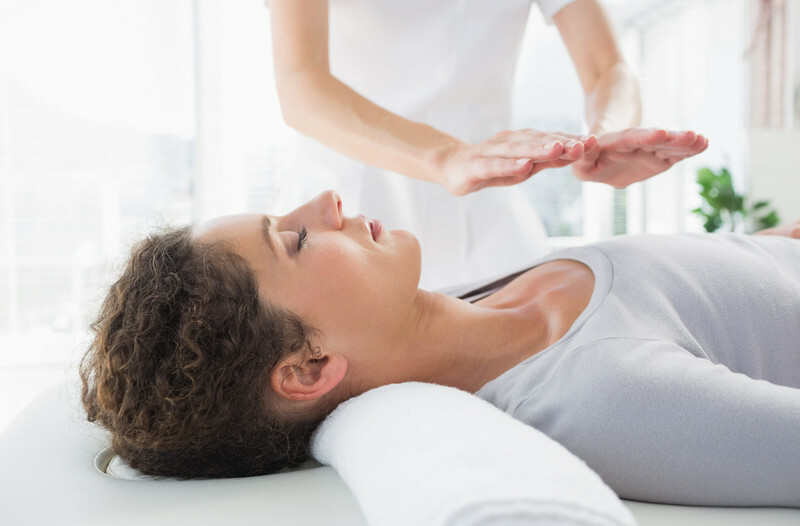 Reiki and Energy Work complement licensed medical and psychological care. I had been expecting this surgery for a while now. Part of me was looking forward to the relief in physical and emotional pain; while an other part of me was dreading it. Now, it’s done. And I feel good. This is the ongoing story of my Sacral Chakra. 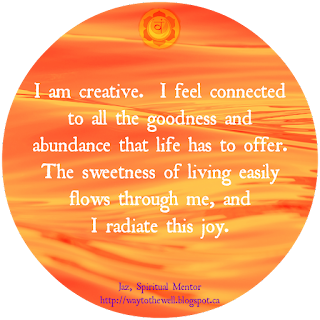 In everyone, the Sacral Chakra governs creativity, joy, sensuality, and enthusiasm. The choices we make about how we enjoy our life experience, how we enjoy our bodies, how we enjoy creating, playing, and experiencing all that life has to offer… all these choices influence the health and vitality of our Sacral Chakra. I have a history of making choices that are not very life-affirming. And I am changing that! In my childhood, I learned how difficult friendships can be. I learned that is was safer to keep my true thoughts and feelings to myself. I learned lots about rejection, ridicule, and shame. These stories continued in my teenage years, where my calm sense of confidence was really hiding a need to please, to be accepted, to be valued - but at the same time, I could never be just ME. I learned about anxiety and panic attacks. By the time I entered my twenties, resentment, victimization and anger had built to a boiling point. I gave up a lot of what made me truly happy, like dancing and travelling. I chose to be serious, get a boyfriend, have a real job, get married, get a house… My mind built a plan - and it did not matter with whom these things happened, as long as I could check these off the list of to-do’s and gain a certain feeling of accomplishment. Then I learned that feelings of accomplishments can leave one feel very empty and depleted. When the mind’s plan does not take emotions into considerations — it’s a half-baked plan. I hated my relationship. I hated my job. I hated my body. I hated my family. I hated myself. Big - huge! - downward circle of negative emotions. And with the feelings of loneliness and abandonment I’ve had since childhood, I felt as if there was no one I could turn to. So these negative energies grew, simmered, festered. When energies like that are not addressed in the spiritual, intellectual, then emotional aspects of the physical experience, they start manifesting as deep and chronic physical distress. My natural cycle went hay-wire and I no longer could depend on its regular rhythm. Fertility became an issue. In my early thirties, I received three surgeries to help relieve the pain of the diseased organs. But there was a lot of emotional gunk that also needed to be cleared. Thankfully, that’s when I started on my own spiritual path of healing and was able to uncover and release several patterns that had plagued me for several years. Now in my forties, I feel stronger. And I feel my strength does not come from a place of confrontation, but from a place of inner peace. I can find harmony and joy in every day. I have forgiven many of my past traumas, and I’ve learned valuable life lessons. I’ve made some tough decisions like leaving a job where I felt like an emotional and mental zombie, with bursts of uncontrollable waterworks. Now, I choose to end the struggle. I choose to reclaim my power. I choose to be truthful to my best, most divine, self. I choose to walk in peace. This surgery last week removed the interior lining of my womb. As I did energy work in preparation for this procedure, I imagined the removal of the layers of poor choices I’ve made through my life. I imagined layers of pain being burned away and purified. I saw myself rising stronger, healthier, and more vibrant than ever before. I let go of wounds and pain that were weighing me down in my journey. I also offered this procedure as some sort of “human sacrifice” whereby through me and the continued energy work I do, others can also clear old wounds, feel uplifted, and reconnect to what makes them feel happy and fully alive. I also choose to become better at receiving. In preparation for my surgery and recovery process, I gratefully accepted good vibes, energy work, Reiki, and prayers from friends, family members, and my growing community of clients and students. I felt very well surrounded, energetically, as I underwent the procedure. I credit my speedy recovery to all the good vibes I received! Compared with the surgeries I received 10 years ago - there was no dizziness post-anaesthetics, no pain, no cramping, no emotional upheaval… only peace, vitality, and joy! Energy work ROCKS! It makes my heart sing! Looking ahead from here, which feels like yet an other turning point in the spiral of life, I know I still have some tough choices to make to feel even more aligned to my Truth and my Joy. And yet, I know I have the inner strength, the inner resources, AND the external support to move forward with even more grace, confidence and true lasting happiness. I am wishing you all blissful health and harmony, on all levels of your being. 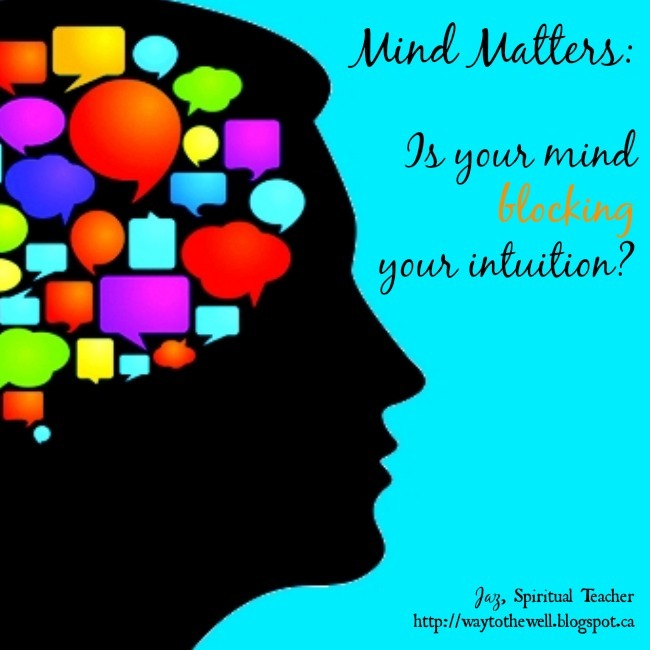 Is your mind blocking your intuition? Now that the dust is settling a bit on the newness of 2016, I feel it’s time to complete the series on how to increase the effectiveness of your intuitive readings. It will help you set the intentions you want to manifest with a clear mind and soulful purpose! 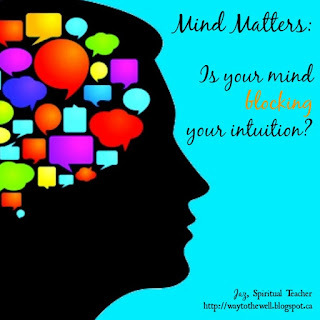 This week’s topic is so important: being aware of mind traps will help you increase the accuracy of your readings because this awareness will help you realize when your mind is controlling the session, and when real intuition is actually flowing. They are obsessed with an outcome. Their mind has decided on a solution to their situation, and they are unwilling to let go of it - even if they are asking for intuitive validation. For instance, one client was so obsessed with validating that this person was “the one”, the soulmate, the twin flame… that she actually started stalking the object of her desire. Her mind interpreted any sign of life as a sign of destiny. Every action and interaction would serve to rationalize her obsession. The question of every session was, “Tell me that this is the one.” You see, when you keep asking the same question every day… it’s a sign that your mind is obsessed and not truly open to receiving intuitive insights. It just wants to be right with whatever solution it came up with. They ask the same question over and over again, or ask about the same possible outcome, to several psychic counsellors or using all their intuitive tools: this is also a sign of mind obsession. You might think you want to gain clarity, but all this asking actually creates confusion and mind fog, and this mind fog can keep you from taking a step in the direction of your highest good. It’s like one of my students who wanted to know if she would get a specific job. She asked me for insights, then she asked her pendulum, then she read her own cards, then she asked someone else, the she asked her pendulum again… and became very frustrated that she couldn’t get a clear answer. She became obsessed with asking her intuition for “the definite answer”… and meanwhile forgot to take action steps such as following up with those who interviewed her, or staying open to other opportunities. They fall asleep or start daydreaming about a gazillion other things when trying to do intuitive work. This is usually a sign that the mind doesn’t want you to know what the real issue is all about, because it’s afraid of your reaction if you find out. Somehow deep inside, you want to protect yourself from an emotionally charged reaction, so your mind is using the old, “Look -squirrel!” method. I have students who tend to always fall asleep during specific meditations to uncover blocks; and we know that it’s not because they’re tired! I also have clients that start rambling about their children, or their mother, or this clutter in the home when I ask them about a specific block. The distractions keeps them from discovering their truth. Can you relate to any of these mind traps? Here are a few tips to help you move beyond the mind to truly tap into your intuition. Assess why you want to gain intuitive insights in the first place: is it to validate a hunch? Because you’re curious? Because you want to know you’re right in doing what you do? Because using your intuitive tools makes you feel like you’re doing something… while actually avoiding taking real-world action toward your goal? Exercising discipline and doing some reflective work before reaching for your psychic tools can actually bring you a lot more insights and self-knowledge than a mind-driven session. Ask yourself if you really want to know the answer, even if it’s not what you expect. Do you feel that a different solution, perspective or approach would derail you? Then your mind is in the driver’s seat - it’s up to you if you want to claim back your power. To prevent you from falling asleep, keep your eyes open when you dowse or meditate. Keep your body busy by dancing or walking while meditating, or do a cardio session before your intuition work. Practice discipline, and once you ask a question… wait before asking the same question again! If you feel you need to ask the same question several times a day, or week, or month… there are blocks to truth hidden in there. I can help you uncover them as you flex your self-confidence muscles. I trust this series of articles on asking masterful questions has helped you increase the accuracy and depth of your personal readings. I so enjoy reading your emails and comments about your progress and “a-ha” moments! Now, what I’d really love to know is if you’re interested in learning more about your intuition skills and about energy work. The Intuition Development Program starts in person on March 2nd, and it’s such a fantastic program I’m always excited to offer it! I’d love to teach it online as well, and I know that my intuition tells me it’s time to do so… I’d like to know if you’re interested in taking an online program with me, and what day of the week would work best for you. Could you send me an email or message me if you’re interested? Thanks! In my last article, I talked about the Solstice and a few of the practices I love to do at this time of year. I take advantage of the long nights to go within and reflect. I dance, I paint, I read Tarot. This year, Universe even had the sense of humour to send me the flu to make sure I took time off and rested - gee, thanks Universe! I never know what my paintings will look like, what colours will be prominent, and what the message will be. I just tune in, pick up my brushes, paint and see the result unfold - at the same time I receive messages from my Higher Self and my Guides. This year, I was quite surprised that the colour scheme was so bright and yellow, although the night sky is on the baby's cloak whereas it was the main colour for previous years. 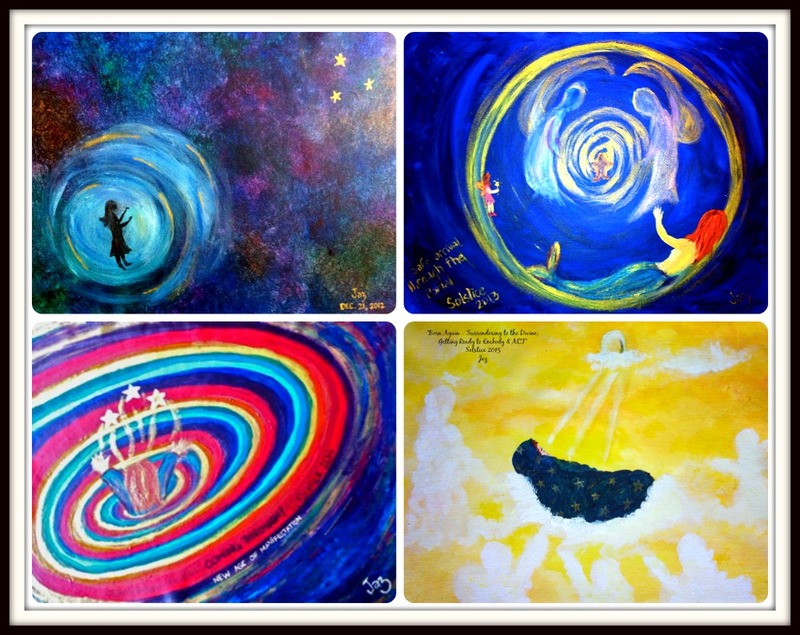 Here's an overview of my paintings - and of my spiritual evolution - since 2012 (from left to right, top to bottom). Do they resonate with you, too? So, what are the messages for 2016? I am looking forward, and at the same time am a little bit nervous (ok, I'll admit I'm a little scared!) of what this year will bring. Why? Because it's brand new energy - and we can't embody this new energy the same way we've been living with the "old" energy. This is the year of being born again and although this is very exciting with so many new opportunities presented to us, it also means we need to learn to surrender to the Divine. Since the Solstice, I received many messages that the Divine is ready to support and nurture us as we grow and transform -- but we need to accept this help through the act of surrender. And damn that's a tough thing for me to do! I'm more often than not in my head, planning, thinking, learning, holding back mentally until I know it's safe to proceed... Allowing myself to be taken care of is new and very foreign, and I'm not sure I'm going to like it; at least that's what my head says. Since 2012, many of us have been hearing the call to change. Many of us have actually made significant changes in our lives, on so many levels. For me, it was quitting my government job to start my spiritual work full-time. For others, it was ending relationships, changing jobs, trying new spiritual practices, dealing with emerging health issues... It felt like a lot was happening, yet at the same time everything was on hold. You could feel the great potential, and yet the time was not quite ripe yet to get the anticipated results. Can you relate? Well, the time is now. What was on hold will unblock. What you have sowed these past few years, you will harvest. No wonder I had a bit of the flu and stayed in bed for almost 3 days, sleeping. My body was resting from all that journey and getting ready to embody this new energy! When I look at the series of paintings, I clearly see the evolution from feeling lost, making my way "home", finding the portal and taking a whole year transitioning through, ready to manifest magic and miracles... and now having fully arrived but wrapped up and needing to be taken care of as I grow in strength and wisdom. Notice that the blanket has 11 stars along with the Triple Moon on the crown, and look at all the guides shaping up to receive us and help us grow! This year, we are asked to grow our awareness of, and our relationship with our Guides and spiritual mentors, and especially with the Goddess. This year, we are asked to consider ourselves as apprentices to the Divine - and this means discipline, focus, and application of our spiritual tools. We need to find the help we need to understand and apply our spiritual gifts. We must take the time to meditate, to look for signs, to ensure we are energetically aligned with what we do. We must be vigilant about our own self-sabotaging and aware of our patterns of resistance, so that we can stop those behaviours and become more receptive and open to Spirit. Notice also the prominence of the colour golden yellow. This is a masculine colour and it vibrates with the Solar Plexus Chakra. It is a joyful colour, and it stimulates us to action. It is the colour of the Divine Masculine, our power centre, our time to shine and to say, "hey, world, here I am, and I'm ready to shine so I can happily serve for the highest good! I'm ready to contribute my gifts!" This year, we will likely be presented with many challenges to help us balance our feminine and masculine energies. We need to cultivate our ability to listen to our spiritual insights, AND implement them. We need to rest AND take action. We need to surrender AND keep journeying forward. We need to seek how to serve the highest good AND ensure our own true needs are met. We might travel AND cocoon. We need to find the help that is required for us to fulfill our soul's mission. Our actions will be questioned; our lifestyle might go topsy-turvy; we might experience ups-and-downs of radiant joy and heavy resentments and anger... Ah! Transformation! In numerology, this year resonates with "9" (2+0+1+6=9). This means we are at a year of completion. Many cycles will come to a head or to an end. You will see the results of your efforts and work from the past 3 years. It's a year of karma where you will experience the consequences of past actions and decisions. You don't like what you see? Don't blame others/society/your upbringing... see where you can take responsibility for your own actions and choices, and plan to do something new and better for the next cycle. The more we resist the changes, the more difficult life will be. If you can develop your resilience through meditation and mindfulness, then it will be a year of extreme growth, learning and transformation. You get to choose how you will experience this new energy! Often, when we go through a big transformation process, we don't feel like moving. There is the risk for weight gain and health issues linked to a sedentary lifestyle. When we don't move our bodies, our emotions and thoughts can't filter through our energy field; instead, they stagnate. Our body becomes unable to hold on and embody the new energy, and we become sick or depressed. For your overall wellbeing and for your spiritual development, consider sticking to an exercise routine. It doesn't need to be complicated, but make sure to get a good cardio workout on a regular basis. New thoughts and perceptions have a hard time germinating in a stiff body - so stretch your body every day! Stretch mindfully, affirming that as you stretch your body, you also stretch your ability to receive new insights, or to embody new energy. Practice a few inverted poses, like downward dog, and keep your eyes open as you do so. See the world from a new angle; it will help sharpen your mind and creativity! Open yourself to new experiences. Try new foods. Try a new haircut or colour. Change the route you take to work or to the grocery store. Buy some fruit or veggie you never tried before, and taste it. Join a new social group or volunteering organization. It will destabilize your taste buds or your routine for a short while, but will do you much good by teaching you about how you can handle change. Your resilience muscles will be strengthened! Consider taking classes and workshops that will hone your spiritual skills. Find a mentor or two. I offer a wonderful coaching program and amazing classes and workshops. I'd love to journey with you. Click HERE to explore your needs and how I can best support you. Want to clear old karma and patterns of choices that aren't serving your highest good? Consider booking a Soul Profile & Realignment session, where we'll explore your soul's matrix, your gifts, and clear some old negative stories your soul has been holding on to. I am surrounding you in Love, and wishing you much Joy in this new year. Remember to be very gently with yourself this year - great changes and great possibilities are available to you, but it's all about the baby steps! Are you ready for the new energy coming our way? I love this night, the longest night of the year. I find it mysterious, empowering, challenging an exciting! For the past few years, the Winter Solstice not only marks a change in season - it's officially winter even though it's the warmest and rainiest December I've experienced - it also marks a change in energy. I used to think that the whole Solstice, Aztec Calendar, 2012 predictions, Stonehedge ceremonies were just a bunch of New Age hocus pocus... but then I noticed. I noticed the subtle and not-so-subtle changes in my life that are seeded at the Solstice. I noticed my change in outlook. I noticed my change of energy. I noticed the changes in my clients, colleagues and friends. I experienced major shifts in my energy work, with more Guides, more precise energy, more confidence. Strong with this experience, I now consider this night very special and holy indeed. I love how this night is quiet - and yet is filled with energy. If you really stop to listen, you might just hear your Guides speaking to you. You might just hear messages from your animal spirit tribes. You might hear love notes from deceased loved ones. This is a night of deep magic. This is a night of hope and love and learning. This is such a special night to connect the different pieces of you that you've tried to hide but are now holding you back. This is a night of healing. As I write this, I see the ancient Egyptian Goddess Isis coming forth with her deep blue wings, opened wide to welcome you in her embrace. She is ready to help you on your journey to feeling whole, spiritually connected, empowered. You only need to accept her Love and her help. In her mythology, she travelled up and down the Nile River to find the pieces of her husband, the God Osiris, who had been dismembered by his vengeful brother in a struggle for the Egyptian throne. Isis found all the pieces, created the first mummy, and the first mummification ritual to bring Osiris back to life. 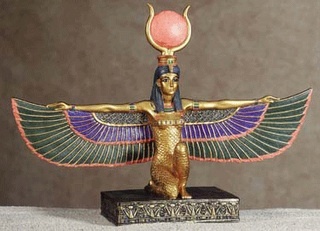 In doing so, she also brought back Light (Osiris is the Sun God) and order to the Kingdom. Hers was a journey of Love, of service, and deep life-giving magic for the highest good of all. I love that she is stepping forward to be our guide this year! She is one of the most ancient and powerful goddesses; let's get ourselves ready to work with her! Give yourself some quiet time to reflect on pieces of you that you have left behind due to pain, shame, or the need to fit in. Is it a funky, spunky part of your personality? Is it your inner rebel? Is it the part of you that truly believes in magic? The part of you that believes in true love? Write about it in a journal, or draw a picture, or paint what this piece means to you. Then close your eyes, and ask for help to make peace and find forgiveness. Know that you are now strong enough to reintegrate that piece of you in your current life. See yourself bringing that piece of you in your body. Where does it fit? Your heart? A chakra? Breathe it in, feel it... and take time to rest. Now that you acknowledge that piece of you, what is possible for you? Put on your favourite music, and move your body! Dance! Too often, we allow our minds to direct our life... for just a few songs, allow for your heart and your spirit to move you. Find balance as you integrate your body, your spirit, your soul. Enjoy your body and how it moves. Speak lovely things to your body. Listen for its wisdom. Light a deep blue candle in a gold dish. Burn incense. Meditate on your biggest dream, your biggest desire. Ask for the courage and strength to find all the pieces of the puzzle, all the resources you need, and the wisdom to see your dream or desire manifest. Remember that your quest will include action, not just wishful thinking. Ask about your next right action step, listen for the answer, and DO IT. Enjoy this special night and all the nurturing energies that are coming forth to help you to your own greatness. Always remember your beauty and your magic. Always remember that you are not alone on your journey, even though it might feel like it on the darkest of nights. Walk through this new energetic portal with grace, and with a new feeling of wholeness and enchantment. Do you need some extra help? I'd love to help you uncover pieces of you that you've buried so deep you don't even remember what they are. They hide under beliefs and patterns. They might feel heavy or sluggish in your chakras. They might feel like empty space in your heart. See what can shift in a session with me. Click here to book. I am surrounding you in Love, and wishing you much Joy in this new year. Hi! I'm Jaz: the girl-next-door with whom you share your dreams, your visions and your fears because you know she will not share your deepest secrets. And if you're spooked from seeing a ghost or some "weird stuff" -- she'll reassure you, sit with you, and talk you through it until you feel empowered to deal with the situation. Yep: that's me. Quietly reassuring women all over the world that it's OK (and about time!) to reclaim their spiritual gifts. I'm teaching women to manage their stress so they feel more grounded and centred. I'm coaching them to open their hearts and minds to greater intuitive insights and growing psychic skills. I love to curl up with books, a hot tea or coffee, and dark chocolate. I love being out in Nature, listening to the birds, and dancing under the moon. I have a big collection of essential oils and crystals, perfect for all types of meditation. One of my first passion is teaching. If there's anything you'd like to know, ask away! If I don't know the answer, I'll point you in the right direction.